The Irish government is looking at a revised offer for airline Aer Lingus from British Airways owner IAG. Ireland is considering the proposed deal in terms of its effects on competition, transport links, and jobs, its transport ministry said. The Irish government has a 25.1% share in Aer Lingus, and must agree to any deal before it can go through. Ryanair has a 29.8% stake in the airline, and also has a power of veto. Irish transport minister Paschal Donohoe said the government would give the proposed deal "very careful examination" before taking a decision. "There are important considerations to be taken into account in addition to price," he said. The effects on competition in the market, transport links to Europe and the US, and jobs associated with those transport links must be taken into account before a decision is made, a spokesman for the department said. Irish airline Aer Lingus has said it is willing to accept a €1.36bn (£1bn) takeover offer from British Airways owner IAG. But Aer Lingus said before it formally recommends the offer, IAG must "address the interests of relevant parties". That is thought to mean its two biggest shareholders - the Irish government and Ryanair - and the unions. The Irish cabinet held its weekly meeting on Tuesday, where the IAG offer was discussed. In a statement, Aer Lingus said: "The board has indicated to IAG that the financial terms are at a level at which it would be willing to recommend [the offer] subject to being satisfied with the manner in which IAG proposes to address the interests of relevant parties". Aer Lingus also stressed that IAG plans to operate Aer Lingus as a separate business, with its own brand, management and operations, should the takeover go ahead. The trade union representing most Aer Lingus staff, Impact, has said that a takeover could lead to the loss of up to 1,200 jobs - a quarter of the workforce. IAG's primary interest in the Irish carrier is its 23 pairs of take-off and landing slots at Heathrow airport - valued at about £30m apiece - allowing it to operate more flights. Ireland's deputy prime minister warned at the weekend that protecting the country's air links with Europe and the US was vitally important in terms of inward investment, exports, business and tourism. Joan Burton told RTE Radio: "What we will want to do as a government, and what's absolutely important, is to protect these slots and the connections of direct flights in and out of Ireland." Aer Lingus directly employs 3,900 people, mostly in Dublin, with 2,100 of these described as ground staff in areas such as clerical, operative and back office roles. A takeover may also face competition concerns from European regulators. If IAG, which owns Spanish carrier Iberia, was forced to sell some Heathrow landing slots owned by Aer Lingus it could undermine the rationale for the deal. Aer Lingus is the fourth-largest operator at Heathrow after BA, Lufthansa and Virgin Atlantic. Here's what I believe to be IAG's game plan. On Aer Lingus, IAG has revealed that the airline will remain as a separate entity with its own brand and own management. That will allay concerns within Aer Lingus that IAG would swallow up the airline as it did with the old British Midland carrier, bmi. That loss making airline, formerly owned by Lufthansa, became part of BA. And given that Aer Lingus has already been through a significant restructuring and is making money, any efficiency drive (and IAG's chief executive, Willie Walsh, is famous for them) will be limited. For Ryanair, Michael O'Leary, the chief executive, will want to ensure that he receives the best price possible for his 30% stake. But given that he is likely to be a willing seller following competition concerns over the size of his holding, IAG will argue that €2.55 a share is not too shabby. In a separate statement, IAG said that Aer Lingus had now allowed it access to its financial books to "perform a limited period of confirmatory due diligence". IAG's offer is worth €2.55 a share. Aer Lingus had rejected two previous IAG offers - pitched at €2.30 and €2.40 a share. 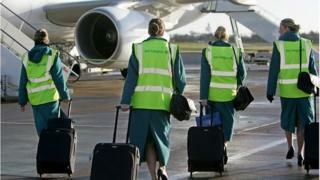 Aer Lingus shares were up 1.9% at €2.41 in afternoon trading on Tuesday, while IAG shares were also up 2.2% at 561p. Ryanair built its stake in Aer Lingus as part of three failed attempts to buy the carrier. Competition regulators blocked the takeover bids and told Ryanair it must sell all but 5% of its shareholding. However, an immediate sale was delayed by a lengthy appeals process. Robin Byde, a transport analyst at Cantor Fitzgerald stockbrokers, said IAG was seeking to build on Aer Lingus's lucrative niche on transatlantic routes, which offers customs and immigration clearance in Dublin and Shannon for flights to the US. But he was wary about the politics of the deal and the potential for IAG to get "dragged into prolonged and distracting negotiations".